I'm a tea drinker. Morning, noon, night. Tea. Morning it's usually a green tea, followed by something like a rooibos chai later in the morning (usually a homemade 'latte chai'), a decaf green or mint tea in the afternoon, and maybe another rooibos or apple chamomile before dinner. I've never taken to coffee, but I love my teas. Now that summer seems to be in full swing, I don't aways want a warm tea in the afternoon. I love iced teas, but find almost all of the commercial brands are too sweet, pumped up with sugar or hfcs. But then, the more 'natural' varieties are pricey, and most use green tea - and in the afternoon I don't care for a caffeinated brew. No, I want something slightly sweet, definitely refreshing, and plenty of it! So, I make my own. It's easy, affordable, and good for you. This week I made a large batch of Hisbiscus-Lemon Iced Tea. Hisbiscus is a flower, and hibiscus tea 'leaves' are made from the flower itself. It has a slightly tart, almost cranberry-like flavor, and a beautiful maroon color. First thing in the morning, prepare your tea, and then allow it to steep and cool through the morning. In the afternoon, once cooled, add the lemon juice and stir in stevia powder (or agave) to taste. Add ice, (and fruit slices or berries), and stir. Sip! Enjoy!! I just LOVE hibiscus tea, and this sounds amazing! I like to think my hibiscus-tea days started with good old Celestial Seasonings Lemon Zinger! I'm not a fan of coffee either. I like how it smells, but can't stand the way it tastes. I always have my thermos full of green tea, every morning...no matter if it's a warm summer day, I need my hot tea to start my day! And, I must admit, I'm a boring Lipton iced tea girl in the afternoon. We have a wonderful company who makes delicious organic teas (Light of Day Organics) who are just down the street from my house. I'll have to pay them a visit and see if they carry any hibiscus. Thanks for the refreshing recipe!! Sounds fabulous, I haven't tried hibiscus tea before but it's been on my curiosity list. It's winter over here now but it will definitely be on my list for when it warms up a bit over here. this sounds like a great combination! I have always enjoyed hibiscus tea and double ginger tea (a bag of each steeped'll do it) all summer long, but this sounds like worth putting in rotation! whew! It's so warm right now that looks like it would hit the spot! I'm a fool for a good hibiscus tea - and I love that you added lemon to it. So simple - and so delicious! Use real hibiscus flowers -- and it is so much better. 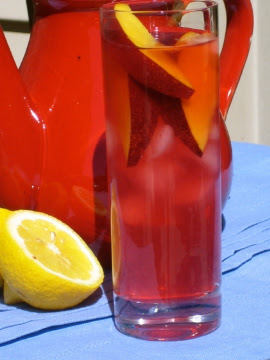 I used beet sugar to sweeten my tea and then I slice lemon into it and maybe squeeze the juice of one lemon for about 2 gallons of jamaica, as we all it in Spanish. Jamaica con limon! Sabroso.